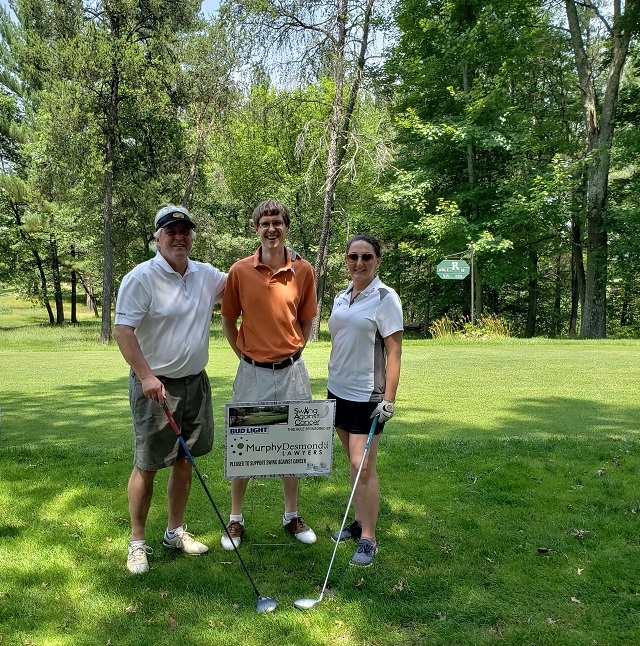 On June 25, 2018, attorneys Tim Casper and Brian Thill, along with legal assistant Carol Schroeder, attended the Swing Against Cancer Golf Outing at The Ridges Golf Course in Wisconsin Rapids, Wisconsin. For the third year in a row, Murphy Desmond sponsored a hole and a foursome for this event, which directly benefits patients with expenses related to their cancer, including medication, lodging expenses, or whatever financial assistance they need. (Left to right): Tim Casper, Brian Thill and Carol Schroeder attend the Swing Against Cancer 5th Annual Golf Outing.